ESPN: North Carolina State coach Tom O'Brien has been fired after a disappointing 7-5 season, the school announced Sunday. 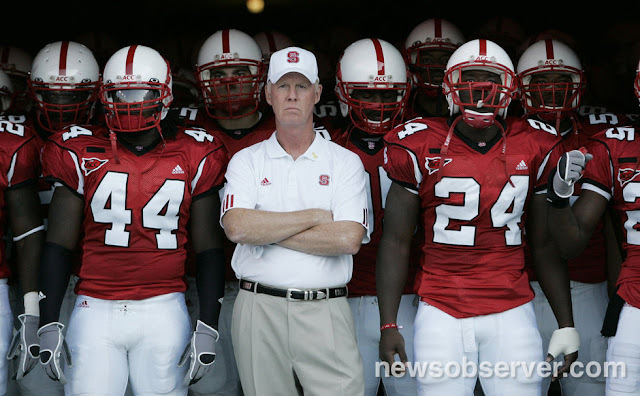 O'Brien will not coach in the Wolfpack's upcoming bowl game. Offensive coordinator Dana Bible has been named interim head coach, and all assistants have been retained through at least the bowl. Even though O'Brien has led the Wolfpack to three straight bowl games, his teams have failed to live up to expectations throughout his tenure. O'Brien went 40-35 in six seasons -- but just 22-26 in the ACC. "I appreciate the opportunity to have coached at North Carolina State University and I feel that the program is in a better place now than when I started," O'Brien said in a statement. "I'm proud of the young men that I have coached here, for their accomplishments on the field and in the classroom. "Wolfpack football is as sound academically as it's ever been with a (single year) APR of 990 to be reported this spring. I appreciate all of my coaches and wish them the best and I look forward to life after football." During a news conference, athletic director Debbie Yow (the former A.D. at Maryland) said she met with O'Brien on Friday to discuss the future of the program, then notified him of her decision Sunday before meeting with the coaching staff and players. "I told them it's really fairly simple," Yow said. "Coach O'Brien and I agree on the goal of becoming a top-25 program. We just don't agree on what it takes to do that, how to get there." Yow said O'Brien's buyout would be $1.2 million over four years. This season provided the perfect example of how North Carolina State fell short of what many believed could be an outstanding season. The Wolfpack were embarrassed in the season opener by a Tennessee team that won only one SEC game. It is about time. Just look at Basketball... Debbie yow doesn't play...she almost quit school because they had recess...She doesn't play!! !